Tá sé ag cur báistí anseo i gCúil Aodha ar maidin agus an spéir dorcha go maith. Ach thug mé faoi ndeara an íomhá spreagúil seo ó Bhéal Feirste ar shuíomh Mhairtín Uí Mhuilleoir. Is amhlaidh go bhfuil balla sealadach crochta thart ar an gCultúrlann mar go bhfuil tús curtha le h-athfhorbairt ansan – agus má chrochtar balla in áit ar bith ar bhóthar na bhFal – sealadach nó buan – bionn leitheidí Danny Devenny ann chun é a mhaisiú le múrphictiúir. Spreagadh ar leith dom é go bhfuil duine de mo laochra, Gearóid O Cairealláin, ar an múrphictiúir seo agus é ag ól sláinte Bhéal Feirste. Ar ndóigh is lochrann dóchais dúinn é an dul chun cinn atá ar bun ar chúl an íomhá seo. Scór bliain ó shin ba stóras brat urláir a bhí san iar Eaglais Phreisbitéireach ar Bhóthar na bhFal. Anois is cuisle beo iarthar Bhéal Feirste é. 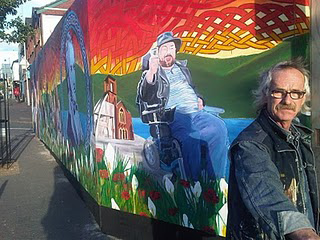 Go deimhin níl aon rud nó foirgneamh a mheallfadh ar ais go Béal Feirste mé seachas an Chultúrlann agus na daoine galánta ann. Anois tá forbairt ar fiú níos mó ná €5m le déanamh ar an gcroí-ionad seo – nuair a loirg siad airgead ar dtúis, dúradh leo gur ‘eilifint bhán’ a bheadh ann. Anois is é an seod i saol Ghaeilge na tíre. Ach ní bheadh sé ann ach amháin díonghabhailteacht na gceannródaí, Gearóid O Cairealláin agus Séamus Mac Seáin. Anois tá glúin nua ag teacht chun tosaigh chun an Cultúrlann a thabhairt ar aghaidh go dtí an chéad chéim eile agus tiocfaidh glúin eile ina ndiaidh san arís. Cad é an beart ceannródaíochta ar féidir le daoine atá i suíomhanna ceannaireachta i réimse na Gaeilge tabhairt faoi sa ré seo, cibé áit a bhfuil tú ar fuaid na tíre nó ar fuaid an domhain? Sin ceist a thiocfaidh mé ar ais chuige ar ball…. Foilsiú: 08/10/2010 . igaeilge a d’fhoilsigh. Ranganna: An Ghaeilge, Cúrsaí Reatha, Cultúr. Clibeanna: Cultúrlann McAdam Ó Fiaich, Gearóid Ó Cairealláín. Tugaim faoi ndeara go bhfuil mo shean chara, Máirtín O Muilleoir, ar thuras lena chomhleacaithe ó Chiste Infhéistíochta na Gaeilge ar Shabhal Mór Ostaigh ar Oileán Sgiathánach sna hOileáin Thiar. Is fiú a rá go bhfuil an buíon infhéisteoirí imithe ar an dturas ar a gcostas féin – rud a léiríonn dearcadh nua ón gcur chuige a bhionn i réim de ghnath ar ‘quangoes’ ó thuaidh is ó dheas. Tá siad ann chun léargas a fháil ar an slí ar eirigh leis an ionad ceeannródach seo an fhás agus an fhorbairt atá déanta a dhéanamh. Anois aithnítear Sabhal Mór Ostaigh mar an phríomh ionad léinn is cultúir is teicneolaíochta do Ghaeil sna h-oileáin seo. Nuair a leandáileas i mBéal Feirste geall leis ceithre bhliain deag ó shin, ceapadh mé ar bhórd Fhorbairt Feirste agus bhí láímh agam i bhforbairt togra bunaithe ar Shabhail Mhór Ostaigh, an Nasc, ionad ina mbeadh fiontarlann, chun gnólachtaí nua a spreagadh agus a áisiú, is scéal-lann, ina mbeadh scileanna scéalaíochta ag baint úsáide as an nua theiceneolaíocht idir scannánaíocht, teilifís, raidió is eile, á mhúineadh don aos óg agus a bheadh ina cheanncheathrú do thionsal chlos-amhairc an Tuaiscirt. Thugamar cúpla turas orainn féin, turas amháin ó dheas go Gaillimh is Luimneach, chun taighde a dhéanamh ar an bhfiontar agus d’oibríomar ar roinnt roghanna chun suíomh oiriúnach a aimsiú. Sa deireadh níor tháinig an mhaoiniú chun an togra go léir a chur i bhfeidhm agus níor fhorbraíodh ach an ‘Fiontarlann’ is roinnt oifigi san Nasc, foirgneamh atá suite ar Bhóthar na bhFal. Is ceann cheathrú Forbairt Feirste é seo anois agus is cinnte go bhfuil go leor oibre fiúntach déanta ag an eagras, go h-áirithe agus é faoi stiur Jake Mac Siacais, le blianta beaga anuas. An rud ar moladh an chuid is mó de scór bliain ó shin anois, is é sin an rud, go bunasach, atá ag teastáil go fóíll. Idir an dhá linn tá go leor oibre déanta chun an toirt chriticiúil a chur in áit le go mbainfí usáid fónta as an ionad seo – bunú Raidió Fáilte agus Nuacht 24 sa chéad dul síos. Agus níl aon ghá foirgneamh nua a aimsiú. Ar chúl na Cultúrlainne, tá foirgneamh an Springfield Charitable Association agus ba cheart é seo a cheannach laithreach, ar phraghas réasúnta agus é a fhorbairt mar an ‘Scéalann’. Is é an Chultúrlann an áit nádúrtha don fhorbairt seo agus má chuirtear in áít é gan ró mhoill, beidh rath ar an dtionscnamh, creidim. Thóg mé roinnt ceisteanna faoin Chiste seo mar níor thuigeas, nó ní thuigim go fóill, cén fath gur bunaíodh é go rúnda, gan aon phroiseas phoiblí chun baill an choiste a cheapadh, go h-airithe i bhfianaise go raibh deontas £8bn d’airgead phoiblí á fháil ag an gciste. Tá cuid de na ceisteanna sin gan freagra go fóill cé gur aimsigh Danny Browne ar shon Gaelscéal ainmneacha bhallraíocht an Choiste do Ghaelscéal, tar éis gur chuireas an cheist anseo. This is a fortuitous time to visit Samhal Mor Ostaig as we enter a new era of Irish language protection and promotion in the North of Ireland and the advent of the new £8m Irish Language Investment Fund (whose members are here, at their own cost, on a fact-finding mission) but here’s a sobering thought: one building at Samhal Mor Ostaig, the Fas building cost as much as our entire kitty, £8m. An bhfuil ré nua ann, i bhfírinne? Níl a fhios agam. Creidim go leireodh cinneadh infheistiocht i dtionscnamh ar nós ‘An Scéalann’ mar atá molta agamsa go raibh tús leis. Mar a deir Mairtín, ní mór an méid é £8m – ach, níl anseo ach an chuid is lú den infheistíocht. Is iad pobal Ghaelach Bhéal Feirste, i gcaitheamh na mblianta, ceannródaithe Bhóthair Seoighe is na Cultúrlainne is Lá/Lá Nua (nach maireann) is Raidió Fáílte is Aisling Ghéar is Gaeloiliúint(nach maireann) is Chumainn Chluain Aird a dhein an infheistiú ar fad go dtí seo. Na milliún uaireannta chloig oibre tugtha go deonach, saothar nach bhfiuil saibhreas ann chun an obair seo a chúiteamh, an infheistíocht sin. Foilsiú: 22/07/2010 . igaeilge a d’fhoilsigh. Ranganna: An Ghaeilge, Cúrsaí Reatha. Clibeanna: An Cheathrú Ghaeltachta, Bóthar Seoighe, Ciste Infhéistíochta na Gaeilge, Cultúrlann McAdam Ó Fiaich, Gaeloiliúint, Gaelsceal, Lá, Máirtín Ó Muilleoir, Raidió Fáílte, Sabhal Mór Ostaigh, Sinn Féin. Ná h-ábair é, dein é! Is minic go mbaineann mo shean chomrádaí, Máirtín O Muilleoir, as an ráiteas ‘Make No Little Plans’ agus é ag tagairt don phlean uaillmhiannach is déanaí uaidh chun rud éigean ollmhór a dhéanamh. Ar aon nós, nuair a chuala mé roinnt laethannta ó shin go raibh seoladh Tionscadal 16 beartaithe – ón mbean uasal atá i mbun Beyond The Pale PR, Éadaoin Ní Mhunghaile – don lá inniu, Luan Cáxca, d’ardaigh mo dhóchas beagáinín. Plean uaillmhianach é seo. Ach, tá ‘ach’ anseo. Ní doigh liom gur cheart nó gur féidir fánacht ar dheontóir éigean a theacht chun tosaigh le €10m chun an togra seo a mhaoiniú. Nuair a bunaíodh Cultúrlann McAdam Ó Fiaich ag tús na 90aí, ní raibh aon €10m ann. Agus dá bhfanfadh bunaitheoirí na Cultúrlainne ar dheontóir le €10m teacht chun tosaigh, gach seans nach mbeadh Cultúrlann ann go fóíll. Is é an bealach le tosnú ar an togra seo ná é a thosnú. Aimsigh spás éigean i lár na cathrach agus dein caifé Ghaeilge de, mar a deineadh sa Chultúrlann. Bíodh sin ina thús. De réir a chéile a thógfar an chaisleán. 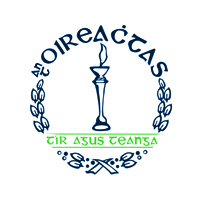 Is cuimhin liom na blianta ó shin, trath go raibh Caifé 3D ag Gael Linn i mBaile Átha Cliath, ná bhfuair sé an tacaiocht a bhí de dhith ó Ghaeil na h-Ard Cathrach chun go dtiocfadh sé slán. Bhíos ann go minic mé féin agus is mó uair a chuaigh mé isteach ann agus gur thug mé cluas le h-éisteacht do Ghaeil mhóra BhÁC ag spalpadh leo i mBéarla! Tá an rud sin ann i measc aicme áirithe Ghaeilgeoirí, go dtaithníonn sé leo ar chúis éigean bheith ag labhairt i mBéarla agus iad ag cur an chuma orthu féin go bhfuil siad níos Gaelaí ná an chuid eile againn. Dá dtosnófaí laithreach le caifé chun tús a chur leis an gcultúrlann seo, bheadh sé chomh maith le €1m sa bhanc. Ansan amharclann – bíodh drámaí á Ghaeilge ar an ardán i ngach amharclann sa chathair agus na sluaite á chur ó dhoras ó na dramaí Ghaeilge agus ní fada go leireofar an ghá atá leis an Ionad Náisiúnta seo. Leanfaidh gach rud eile ina dhiaidh sin. Agus mé á scríobh seo tá an chlár deireannach Nuacht á chraoladh ar an Raidió agus an laithreoir, Caoimhe Ní Laighin, ag tuairisciú faoin ‘dtuairimíocht a bheith ag dul i dtreise go mbeidh Príomh Aire na Breataine, Gordon Brown’ ag fógairt amárach go mbeidh ‘olltoghcháin[sic]’ sa Bhreatain agus i dTuaisceart na hÉireann ag tús mhí Bealtaine. Ar chúis nach dtuigim, níl Nuacht RTÉ ag tuairisciú tada faoin bplean uaillmhiannach seo ar an fheasachán ag 9.53in. Ní gá fánacht go dtí 2016 le go mbeidh an Ionad Náisiúnta seo ann. Níl aon ionad nó foirgneamh ina chultúrlann beo go dtí go dtosnaíonn cainteoirí Ghaeilge ag teacht le cheile in áit amháin ag labhairt i nGaeilge. Tá mo thacaíocht iomlán ag an dtionscnamh seo. Ach tá súil agam nach gá fánacht go dtí 2016 le cultúrlann – a la Béal Feirste – a aimsiú i bpríomhchathair na tíre…. Foilsiú: 05/04/2010 . igaeilge a d’fhoilsigh. Ranganna: An Ghaeilge, Cúrsaí Reatha. Clibeanna: Cultúrlann McAdam Ó Fiaich, Gearóid Ó Cairealláín, Máirtín Ó Muilleoir, Séamus Mac Seáin, Sinn Féin. Tuairim mire eile nó b’fhéidir nach ea! Le fada an lá tá an Ghaeilge beo ar dheontaisí – deontaisí chun tigh a thogáil sa Ghaeltacht, deontaisí chun fostaíocht a chur ar fáil, deontas chun nuachtán a fhoilsiú[go dtí le déanaí] agus iliomad deontaisí eile. Ach má tá an Ghaeilge beo beathach inniu – agus, tá, mar a léiríonn suíomhanna is fiontair ar nós, bhuel, nós*, An Druma Mór, Nuacht 24, Gaelnet, Caint, go leor leor eile, nil aon chreidiúint ag dul do na deontaisí [ach a mhalairt b’fhéidir]. Is amhlaidh go bhfuil nadúr an chaidrimh idir an Ghael agus an Stát – agus na h-udaráis ó thuaidh – bun os cionn. Táimíd ag féachaint ina dtreo ag súil go dtacóidh siad le cibé fiontar atá ar bun againn agus creidimíd mar go bhfuil sé san fhuil anois gurb é an deontas an t-aon uirlis atá ag an Stát chun teacht i gcabhair orainn. Sa tsli sin tugaimíd an cumhacht ar fad, cumhacht beatha agus bás fiontair, don Stát. Ba cheart go dtuigfimís gur againne atá cumhacht beatha agus bás an togra. Gan sinne, ní bheadh na fiontair thuasluaite, fiontair a thugamar beatha dóibh gan deontas, beo ar chorr ar bith. Ní bheidís ag cur le ‘caipteal shoisialta’ an phobail, ag feabhsú an tsaoil don phobal Gaelach agus, mar gur cuid den mhór phobal an phobal Gaelach, don mhór phobal. Ag an am chéanna tá obair ar bun againne ar cheart a bheith ar siúl ag an Stát. Mar shampla nuair a deir Éamon O |Cuív gur cheart go mbeadh cultúrlann cosúil le Cultúrlann McAdam O Fiaich i ngach cathair is baile mór [agus baile beag!] sa tír, is é an chéad freagra a bheadh againn – agus ní cáineadh é seo nó táim féin ciontach as seo freisin – cá bhfuil an deontas chun íoc as. Mar atá’s ag an saol, ní raibh deontas ann nuair a bunaíodh Cultúrlann Mc Adam O Fiaich agus dá mbeadh bunaitheoirí na Cultúrlainne ag fánacht ar dheontas roimh dul i mbun oibre, seans maith go mbeimís go fóill gan Cultúrlann. Conas mar sin a aithneoidh an Stát, agus is cuma an thuaidh nó theas atá tú, nó tá dualgaisí ar na h-údaráis beart a dhéanamh ar son na Gaeilge agus pobal a labhartha sa dhá dlínse de réir caipéisí éagsúla – an Bunreacht ó dheas, Comhaontaithe Chill Rimhinn is Aoine an Chéasta ó thuaidh, an chaipiteal shoisialta atá á chur ar fáil ag na Gaeil? Sa tslí céanna a d’aithin siad an chaipteal soisialta a cuireadh ar fáil nuair a deineadh athfhorbairt ar cheantaracha sna cathracha a raibh imithe i léig – leithéidí Barra Temple i mBaile Átha Cliath mar shampla – le scéimeanna faoiseamh cánach. Dá mba rud é go raibh faoiseamh cánach ar fáil d’fhiontraithe a rinne beart éigean ar son na Gaeilge agus, mar sin, ar son an phobail, nár cheart go mbeadh spreagadh ann doibh sin a dhéanamh agus aitheantas as a gcuid iarrachtaí? Os rud é gur faoiseamh cánach a bheadh i gceist, bheadh gach éinne i dteideal a leithéid – ní bheadh sé teoranta don Ghaeltacht amháin – agus bheadh sé bunaithe ar obair a dhéanamh seachas deontas a éileamh ar bhunús eigean eile – suíomh tír eolaíoch. D’oibreodh sé mar a oibríonn faoiseamh cánach i réimsí eile an tsaoil – sé sin shaothródh fiontar brabhús ach d’fhéadfadh an fiontraí cuid dá chostaisí a chur in éadan an bhrabhúis chun an dlisteanacht cánach a laghdú go mór. Tarlaíonn seo ar aon nós – go deimhin, tá sé ag titim amach i réimse na n-acmhainí nadúrtha nó tá margadh ar leith idir an Stát agus Shell faoin cháin a íocfar amach anseo ar an ollbhrabhús a dhianshaothróidh Shell as an ghás sin a dhíol go h-idirnáisiúnta. Is é an argóint atá ag an Stát ar son an mhargaidh sin, go ndeir siad go bhfagfaí an ghás faoin ghruinneal mura mbeadh sé ann. Céard eile an Ghaeilge ach acmhainn nadúrtha? Ach tá sí á iompó, in ainneoin iarrachtaí tionscnóirí na dtionscnaimh eile agus gniomhaithe diograiseacha eile in eagrais ar nós Conradh na Gaeilge, ina docmhainn. San aoráid seo, tá béim as an nua ar chur amú acmhainní agus nuair nach bhfeictear an buntáiste díreach óna leithéid don phobal mór, tugtar amach na sceanna agus tosnaítear ar an ghearradh. Ceapaim féin gur tuairim réabhlóideach a dhothain é seo ach aithním freisin go bhfuil an réabhlóid sin curtha i gcrich theana féin le beartanna dionghabhailte ag daoine eile – na tionscnóirí thuasluaite, mar shampla, bunaitheoirí Phobal Bhóthar Seoighe, Bunscoil Phobal Feirste (iad san a bagraíodh priosún orthu dá leanfaidís leis an scoil sin!). Foilsiú: 09/07/2009 . igaeilge a d’fhoilsigh. Ranganna: An Ghaeilge, Cúrsaí Reatha. Clibeanna: An Bórd Snip Nua, Éamon Ó Cuív, Cultúrlann McAdam Ó Fiaich, Plean Ghaeilge 2028. Thárla sé os comhair ár súile – rinne sé é go glic agus gan forogra ar bith. Ach, go tobann, tá dhá bhliain curtha leis an plean 20 bliain chun an Ghaeilge a athréimniú mar theanga phobail i dtír dhá theangach ag an Aire Ghnóthai Pobail, Tuaithe agus Gaeltachta, Éamon Ó Cuív. In alt sa Sunday Times inniu, deintear tuairisciú ar an sprioc go mbeidh trí oiread na gcainteoirí Ghaeilge ann faoi 2030. Anois bhí mise den tuairim – agus tá a fhios agam go raibh sibhse den tuairim céanna – gurb é 2028 an spriocdáta a luaigh an Aire Ó Cuív leis an chéad lá riamh a fhoilsíodh an straitéis roimh Nollaig i 2006. An tuairisceoir san Sunday Times, Stephen O’Brien, níl eolas beacht aige ar an straitéis seo nó cuireann sé an scéal seo i láthair amhail is gur scéal nua é agus níl aon tagairt ann do phlean san alt ach is ag tagairt do straitéis a bhionn an t-alt an t-am ar fad. The strategy was devised at a cabinet sub-committee chaired by Brian Cowen, the taoiseach. Currently 85,000 Irish people describe themselves as fluent, daily speakers while 1.6m say they are competent in the language. The government wants these figures to increase to 250,000 and 2m in 20 years. Is dócha nár cheart dúinn bheith ró bhuartha faoi dátaí agus a leithéid. An rud ar cheart dúinn áird a dhíriú air, an straitéis nó an plean féin. Agus níl aon rud ró úr faoin phlean seo. Niorbh é fo-choiste an Rialtais faoi chathaoirleacht an Taoisigh a bheartaigh é ach an oiread ach beirt fhear, Seamus Mac Seáin agus Gearóid Ó Cairealláin, is an phobal a thóg siad i mBéal Feirste timpeall ar Chultúrlann McAdam Ó Fiaich. Dúirt Aodan Mac Poilín ón Iontaobhas ULTACH leo ag an am sin gur eilifint bhán a bheadh sa Chultúrlann ach lean siad orthu lena bplean uaillmhianach. Anois tá an Cultúrlann céanna ina ghormchló ar straitéis athbheochana na Gaeilge ag an stát ó dheas, stat a chaith 80 bliain, mar dhea, ag cur chun cinn na Gaeilge. To achieve this 2030 target Eamon Ó Cuív, the gaeltacht minister, is planning a network of Irish-language cultural centres in cities and towns in order to increase the opportunities people have to speak as Gaeilge. Ó Cuív says he wants Irish-language organisations to follow the GAA’s lead by modernising their facilities and building local centres…. 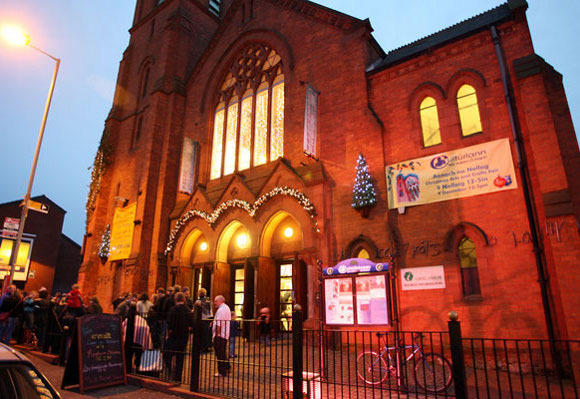 Ó Cuív wants cities and towns to develop a network of Irish cultural centres similar to Belfast’s Culturlann, a converted church now home to a bookshop, restaurant, art gallery and theatre. A second Irish-language cultural centre, Culturlann Ui Chianain, is due to open shortly in Derry. Ach, fan noiméad, ní rud úr é seo fiú ó bhéal Uí Chuív. Ag an Oireachtas i gCathair na Mart i 2007 i nDoire Cholmcille i 2006 nár fhogair sé an uaillmhian céanna, sara raibh cruinniú ag an bhfochoiste seo atá faoi chathaoirleacht an Taoisigh, Brian Ó Comhainn. Rinne mé tuairisciú ar an gcaint a thug sé le h-aghaidh Níl a fhios againn go fóíll, áfach, cé acu an raibh cruinniú nó dhá chruinniú nó níos mó nó níos lú ag an bhfochoiste seo ó shin – ach is cosúil, más aon tomhas an tuairisc seo ar thoradh shaothair an bhfochoiste, ná raibh gá leis ar chorr ar bith nó bhí an plean réitithe roimh ré agus nach bhfuil ag titim amach ó shin ach cur i gcéill de phroiseas chomhairleachta agus meilt ama (is airgid). Ba choma liom sin, fiú, chomh fada is go dtiocfadh Aire Rialtais ar nós Ó Cuív ós comhair an phobail le rá cad iad na pleananna atá ag an Stát cuidiú leis an bproiseas seo. Nílim ag caint go díreach ar airgead. Táim ag caint ar thacaíocht phraicticiúil eile ar féidir leis an Rialtas a thabhairt – faoiseamh cánach sa bhreis le h-aghaidh infheistiú sa Ghaeilge mar shampla? Mo chomhairle ar seo: Ná bíodh eagrais nó gniomhaithe Ghaeilge ag fánacht ar fhoilsiú an phlean seo – cé go gcreidim gur leid laidir é foilsiú an ailt seo ag an am seo go bhfuil sé ag teannadh linn go luath – ach bogaimís chun ár gcuid féin a dhéanamh den phlean. Ar ndóigh tá an bogadh ar siúl theana féin nó tá na h-eagrais Ghaeilge ag gníomhú. Tá Conradh na Gaeilge le moladh as tionscnaimh ar nós Raidió Rí Rá is Seachtain Na Gaeilge is Ceol 09 is an coiste dúiche thar a bheith gniomhach i mBaile Átha Cliath (atá Feirsteach ag tabhairt ceannaireacht cumasach do, maith thú a Sheain). Tá Glór na nGael tar éis udar.ie a thabhairt ar an saol agus léiríonn Comhdháil Náisiúnta na Gaeilge nach bhfuil siad ró fhada ar chúl le tionscnaimh ar nós Gaelport. Tá na Feirstigh fós ceim nó trí chun tosaigh ar sin, forásacht atá léirithe ag leithéidí Nuacht 24. Níl san Aire nó an Rialtas ach imreoirí ar an gclaí sa phroiseas seo go dtí seo – tá sé in am do páirt gníomhach a ghlacadh san imirt nó fagfar ar chúl é ar fad. Foilsiú: 05/07/2009 . igaeilge a d’fhoilsigh. Ranganna: An Ghaeilge, Cúrsaí Reatha. Clibeanna: An Aire Ghnótha Pobail Tuaithe agus Gaeltachta, Éamon Ó Cuív, Comhdháil Náisiúnta na Gaeilge, Conradh na Gaeilge, Cultúrlann McAdam Ó Fiaich, Nuacht 24. Is é seo Iarla Ó Lionaird, an amhranaí agus ceoltóir iomráiteach ó Ghaeltacht Mhúscraí, agus é i mbun coirm cheoil i gCultúrlann McAdam Ó Fiaich i mBéal Feirste deich mbliain ó shin go díreach, trath go raibh mé cois cuain agus ag scannánaíocht liom ar mo dhícheall ag iarraidh slí beatha a shaothrú ó TG4. Tá súil agam nach miste leis go bhfuil an taifead seo agus é ag canadh Aoibhinn Cronán, dán de chuid An Chraoibhín Aoibhínn – Dúbhglas de hÍde a chuir Peadar Ó Riada ceol leis – beo ar an idirlíon. Tháinig mé air ó chianaibh agus mé i mbun píosa scannánaíochta anseo i Múscraí agus thuig mé laithreach an luach a bhí leis. Léiríonn sé seo an pointe a bhí á dhéanamh agam aréir – faoi An Ghaeilge 2.0 – go soiléir. Gan tuiscint nó cumas na Gaeilge ní bheadh tuiscint againn ar áilleacht an phíosa filíochta is an phíosa ceoil seo. Is é sin an fath go mbímíd ag plé leis an teanga, ní ar mhaithe leis an teanga féin ach an saibhreas a chuireann sí ar fáil dúinn. Níl i gceist leis An Ghaeilge 2.0 ach nath cainte ar shlí amháin ach ar shlí eile ba mhaith liom amharc mar shlí eile chun smaoineamh ar an gceist seo, cur chuige nua ar fad. Cad faoi seo mar smaoineamh – táimíd go léir ag caint ar dhroch chás Lá Nua – agus bhí alt bhrea ag Ian Malcolm inniu faoi seo i Lá Nua – agus cad a thiocfaidh i gcomharbacht air. Tá Nuacht Líne an Druma Mór ann gan amhras agus iGaeilge is eile, ach cad faoi cainéal Ghaeilge ar You Tube. Agus cad faoi gaeil ar fuaid na tíre agus ar fuaid an domhain píosaí scannáin a dheineann siad féin a fhoilsiú ann. Is féidir leas a bhaint as suíomh You Tube iGaeilge más maith libh ach é a chur in iúl dom. D’fhéadfadh gur nuacht nó siamsaíocht nó spórt a bheadh i gceist – an príomh rud go mbeadh áit amháin ar an líon a bheadh gach scannán Ghaeilge le fáil ann…. Foilsiú: 04/12/2008 . igaeilge a d’fhoilsigh. Ranganna: An Ghaeilge, Cúrsaí Reatha, Cultúr, Nuacht. Clibeanna: An Chraoibhín Aoibhinn, An Druma Mór, Cultúrlann McAdam Ó Fiaich, Ian Malcolm, Iarla Ó Lionaird, Lá Nua, You Tube.